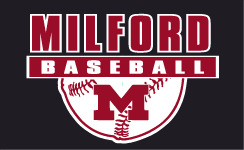 MILFORD BASEBALL Apparel and Accessories are now available to order online! ORDER DEADLINE IS SUNDAY, 3/22/18. No orders will be taken after the 3/22 order deadline. All orders will be held until the order deadline, then processed in bulk. Please allow approximately 2 weeks for delivery. We will do our very best to deliver in less than 2 weeks, if possible. 1. "IN-STORE PICK UP" if you would like your order to be delivered to you at school. There is no additional cost for this option.